In Ipython, help function opens the docstring of the function. Only type the beginning of the function’s name and use tab completion to display the matching functions. 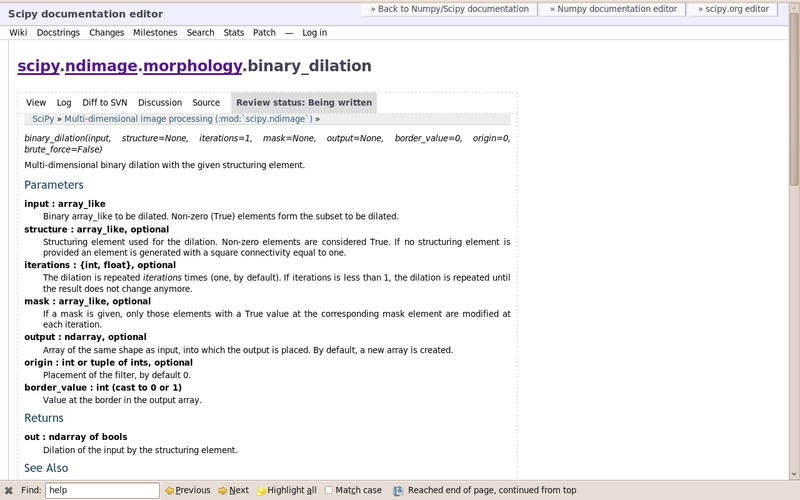 Numpy’s and Scipy’s documentations can be browsed online on http://docs.scipy.org/doc. The search button is quite useful inside the reference documentation of the two packages (http://docs.scipy.org/doc/numpy/reference/ and http://docs.scipy.org/doc/scipy/reference/). Tutorials on various topics as well as the complete API with all docstrings are found on this website. Numpy’s and Scipy’s documentation is enriched and updated on a regular basis by users on a wiki http://docs.scipy.org/doc/numpy/. As a result, some docstrings are clearer or more detailed on the wiki, and you may want to read directly the documentation on the wiki instead of the official documentation website. Note that anyone can create an account on the wiki and write better documentation; this is an easy way to contribute to an open-source project and improve the tools you are using! Scipy central http://central.scipy.org/ gives recipes on many common problems frequently encountered, such as fitting data points, solving ODE, etc. 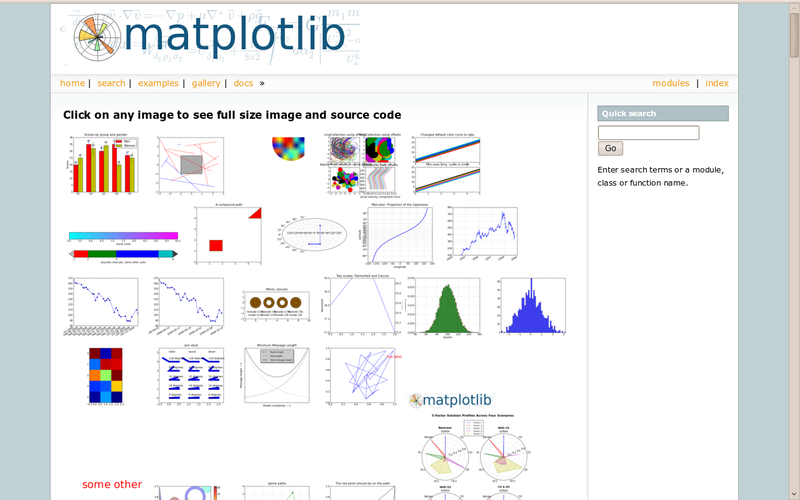 Matplotlib’s website http://matplotlib.org/ features a very nice gallery with a large number of plots, each of them shows both the source code and the resulting plot. This is very useful for learning by example. More standard documentation is also available. In Ipython, the magical function %psearch search for objects matching patterns. This is useful if, for example, one does not know the exact name of a function. numpy.lookfor looks for keywords inside the docstrings of specified modules. Discrete, linear correlation of two 1-dimensional sequences. If everything listed above fails (and Google doesn’t have the answer)… don’t despair! Write to the mailing-list suited to your problem: you should have a quick answer if you describe your problem well. Experts on scientific python often give very enlightening explanations on the mailing-list. Numpy discussion (numpy-discussion@scipy.org): all about numpy arrays, manipulating them, indexation questions, etc. 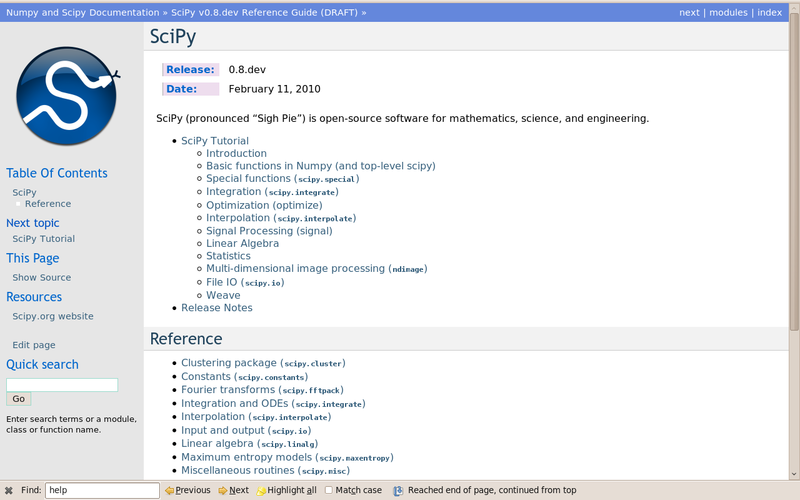 SciPy Users List (scipy-user@scipy.org): scientific computing with Python, high-level data processing, in particular with the scipy package. matplotlib-users@lists.sourceforge.net for plotting with matplotlib.